You built an amazing website, that’s great. Now what? Creating a great website is just the first step in driving more traffic to your business. 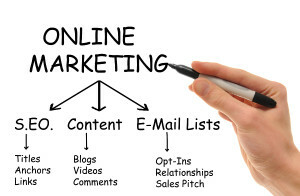 Without an online marketing strategy, your potential customers may never find you. The internet is crowded with companies selling similar products or services. Your business needs to stand out above the rest and that’s exactly what our online marketing campaigns can accomplish. Internet marketing encompass a wide range of individual services, a majority of which are essential to growing an online business. From SEO to design to graphics and logo creation, we’re a one stop web marketing shop. Your internet marketing lesson for the day! by Brad Hartmaier – Web Master, Online Marketing Specialist since 1996. Good web content has always been king. Turning your efforts towards writing good, organic web content is almost always a better use of your time and effort than chasing the latest search engine marketing fad. Organic content refers to website pages that are found primarily by users typing keywords into search engines, such as Google, Yahoo! and Bing. Simple right! The primary goal of search engine companies is to find useful, relevant content for those that use their services. Quality web content that is interesting, readable and on topic will virtually always cause your website to move (or stay) towards the top of relevant search engine results. The best web content is that which answers a reader’s question. Most of us turn to the Internet when we want help with something, like making tuna salad, tiling the kitchen floor or filing for taxes online? Stellar web content answers such search queries in language that’s easy to understand and that speaks to the reader’s need. In short, making organic content work means concentrating more on substance that on ranking. When your site fulfills a need in a readable and interesting way, good search engine ranking will follow closely behind. How can I get more traffic/visitors to my site? At 702 Arts Digital Media, we work with you to come up with the best online marketing plan that’s right for you. What kind of return can I see from internet marketing? We help companies move to differentiated approaches and tactical deployment of marketing promotion budgets. Rather than hire a social media company at $500 a month to post industry relevant content on your Twitter, Facebook, and Google plus, you could find a local organization that has tons of followers already and use their network to build your following and brand. Perhaps offer a charitable donation to their organization (say the Denver SPCA for example) for every time someone likes your Facebook page. Maybe .25 cents per like? Then you develop an army of social fans that know your good will, are familiar with your brand, and already follow you. Next time you post a special deal for your service on Facebook, the reply will be enormously more responsive. And those people will share the promotion with their friends (because you’ve already built trust) and you’ll get more clients. A much better use of your $500. These types of activities are what differentiates us from run of the mill SEO shops, of which there are thousands. Don’t really want someone doing the work for you, but just want to ask a few question of people that do this 60+ hours a week? We’ve got you covered. Our internet consulting offerings include hourly SEO, design and general internet marketing work, whether that be answering questions, installing WordPress pluggins, fixing code errors, or designing a site. In this economy, we understand that sometimes you just want an hour or two of help, and we’re all about helping. For a majority of clients, we build in WordPress. If you have specific functionality that WordPress doesn’t cover such as ecommerece, we’ll use Big Commerce or another solution that works well for your particular necessities. If you have some other backend program that needs to be connected, we can custom code your site and integrate whatever scripts you need. Generally we price designs by the job, and we work very, very fast. Forget about wire frames and long arduous design processes. For the majority of clients, a site will go up in less than a week. Infographics are a great way to get a ton of link flow to your site. Plus, they’re generally interesting, engaging, and contribute to adding interesting content to the web. Unless you go to India, where the results are not necessarily reliable, you’ll spend an arm and a leg. We produce infographics in house or through some of our designer friends in the industry, and keep the costs way lower than if you were to pay retail. Whether you consciously think of your business as a brand or not, as soon as people visit your website, they are deciding to buy or not to buy. Presentation is paramount. It can mean the difference between enormous ROI and dumping money into a pit for 6 months. We put extensive energy into developing a site and web presene that is appealing, attractive, and more, that converts viewers into customers. We can bring your company to the forefront of the online video revolution. Our team of creatives and technical crew can produce a spectacular business commercial, presentation, training video or other promotional video that suits your needs. Our commercials are cost effective internet marketing tools that can convert customers fast. Always put on your best presentation when selling your business online. We can give you that edge.